The absolute composition of a material is useful to distinguish desired from unwanted material phases. Based on the number of electrons measured and the scattering geometry involved, learn how to quantify the amount of each element present in your sample. To discern how much of any element is within your sample, you need to choose an edge to quantify from your spectrum. After you choose the edge (element), you can extract and quantify the specific elemental information. Is the edge energy suitable? What is the accuracy of the edge? Are there other edges present? 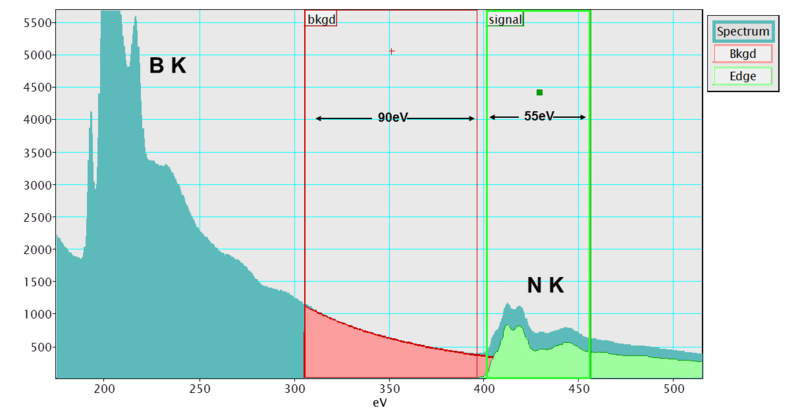 At low energies (<150 eV), it is difficult to extract the edge signal because of other low­-loss features, such as plasmons that make background fitting difficult. On the other hand, at high energies (~2500 eV and above), the spectra have very few counts and tend to be noisier. However at high energies, the background is easy to model and remove. Key points necessary to determine the potential accuracy of an edge are the strength of scattering in that edge and the accuracy of calculating the edge cross-section. K- and L-edges tend to have small scattering cross-sections and will give a low signal. Standard algorithms can be used to compute cross-sections accurately, and thus, these edges are generally preferred for quantification. However for high Z elements, the ionization energy will be too high to be easily measured. For M-, N-, and O-edges, you will get higher cross-sections, and access to higher Z elements. These edges are more difficult to quantify because they have less reliable computed cross-sections. When other edges are present, you may have overlapping edges that can cause difficulty when trying to accurately quantify the material present. You must use a method to separate the edges or model the multiple edges as an ensemble. The fundamental aim of elemental quantification is to identify, extract and quantify elemental specific information. By doing so, you can convert the spectrum to meaningful analytical quantities.